It was extremely pleasing to have it finished though! While I was sewing those uncountable fabric pieces, I really wasn't sure if it was going to look like I had planned. The finished result is, I say, quite close to what I wanted it to look like, so I had a big Yay session! I love fabric shopping and I know you do too ;) There is something about walking into the fabric store and seeing lovely fabric on the bolt on the shelf. It fires me up to go look for some fun fabrics! I love the vibe and I know I will always appreciate any opportunity to go fabric shopping as long as I live because it is so therapeutic and exciting. 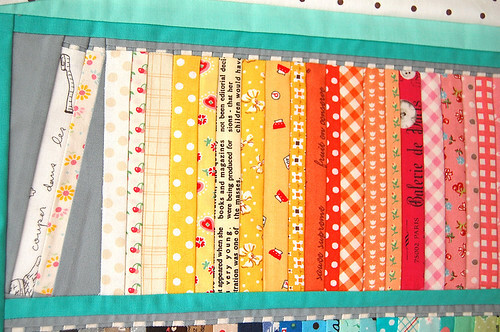 This quilt block for me was to create the kind of a fabric shelf that would hopefully remind Amber of the awesome feel at the fabric store ;) I don't know if she would like any of these fabrics in this fabric shelf, so I added some drawers that she could imagine there are maybe some cool fat quarters in them! At first this shelf had these legs like above. After mulling it over for a few days, I realized they are unnecessary, so I went ahead and ripped the seams and removed the legs. The reason I wanted to add legs were because I was SO inspired by Kylie's easel block which she did such an incredibly amazing job creating perspectives for. I really wanted to do something similar. Although I was pleased with the 3D effect (not as amazing as Kylie's of course), I had come to terms that these legs don't make a lot of sense. They would have to be so super tall to the point some children could easily sneak underneath the shelf! Not so safe! Reconstruction had to happen! 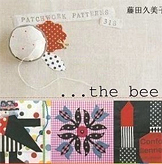 I have been enjoying paper-piecing so much lately and am really excited to get caught up in this bee! Next up is a traditional house for Kerry! Thank you for stopping by ;) I hope you have a wonderful weekend! Oh my goodness, it's amazing! Thats wonderful! I cant believe you even did the teeeeeny little bolt ends on top too - fabulous! it is too cute! amber is going to be so happy and i think that it was weeeeell worth the wait! Unbelievable! I can't get over the tiny tops to the bolts!! I loved it both with and without legs. You amaze me, so worth the wait. I am almost speechless with this block Ayumi but I just have to say something! It really is incredible! Such a feeling of light and fun, and playfulness, brilliant! Absolutely fabulous!!! Love it and that it reminds you of all the good fabric that is around! Thanks for showing us this! I can't believe you did those tiny pieces for all of the bolts. Maddeningly beautiful! Oh my word!! I live this block!! Great job! Wow, that is absolutely incredible! You did a wonderful job!! Oh, Amber is so lucky. Your attention to detail is amazing, with those tiny white squares on top of every 'bolt'. 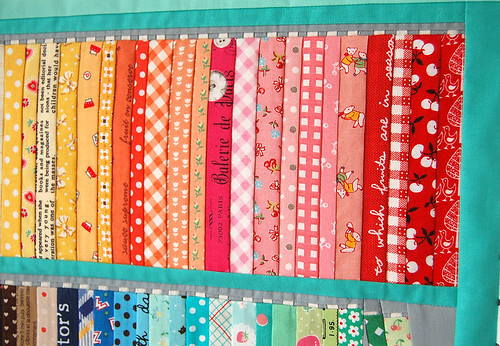 Gorgeous rainbow of fabric, Ayumi, and it totally gives off the fabric shopping vibe. I have a lot of experience, so I know these things. hehe. Whoa, what a great block! Yes, that little strip of fabric above each bolt, it kills me! Amazing detail! Love it! and I agree that Kylie's easel was fantastic and I don't think she ever paper pieced before the bee. Great job, Ayumi! Oh I was just admiring the perspective you created with those wee legs, and then you chopped them off! I love this! At first I thought it was books, but then I saw the little detail at the tops that make it bolts. So cute, and colorful! You have absolutely and totally out down yourself. Stunning, just stunning. I really liked the legs, but this block is another amazing feat by the ever amazing Y.O.U! Love this block so much! And also liked the legs :-) Would love to have this on my sewing room wall. Wow that is amazing ! Would love to have a pattern for it. Love the legs! This appeals to me on sooo many levels....the intricate detail, the lovely fabrics, the rainbow color order, the grainy fabric...I could go on! I think it might have to hijack the postal carrier on the way to Amber's house. Looks great! 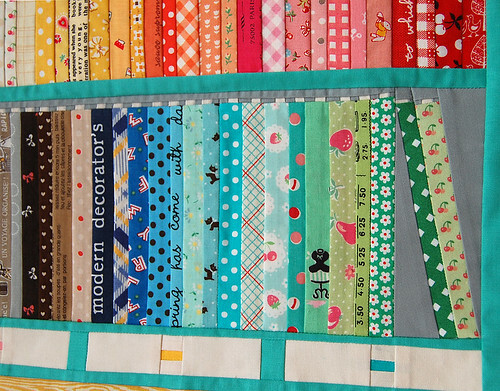 And it is an awesome idea for little stripes of your favourite fabricks. I have some of them I would really like to keep the memory about and this block looks like a great idea for it! Ayumi, this is such an amazing block!!! All of those little pieces!!!! I love every little bolt of fabric. The drawers look perfect at the bottom too. There is so much detail! It must have taken you forever!!! It's unbelievable!!! It look likes a 5000 pieces puzzle! I love the fabrics and their colors. Congratulation about your work of art. Ayumi, It's fabulous! Now everyone's going to be attempting something similar. Congratulations! Love this so much, but then I love everything you do! So clever! Good grief this block is over the top fabulous! How perfect to include the bolt ends sticking out the tops! It really does have the feel of a real quilt shop shelf. Very well done! Hello Ayumi. It's wonderful to see how you tap into your imagination, and find a way to express it in these intricate fabric collages. The imagery and colors and skill of your sewing really combine to create something original. Oh so much fun! At first glance I thought it was a bookshelf filled with books!! Fabric and books-two of my most favorite things! A very cute block in fresh colours.Very inspiring. Wow...Amazing! What a fun block. You are so talented and imaginative! Oh, girl!!!!! That literally gave me goosebumps! Like Krista said, those tiny white squares on the top edges of the bolts are something! They're what make it so realistic, for sure. How big is the finished block? I'd love to see a photo with a ruler along the edge. Thanks for sharing your amazing talent once again. You don't post on your blog that often, but it's always soooooo worth the wait! Squeeeeeeeeeeeeeeeeeeeeeeeeeeeee!! Ayumi, you are the best. The best the best the best. I love it. It is absolutely amazing! I loved the legs too, but it works equally well without them. I would visit a shop (and have done...lots) with those fabrics! Loved the dimension the legs gave the block. Your work is so charming, and as always I'm amazed! 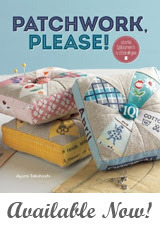 Love this block Ayumi!! Such amazing attention to detail, you really are the best! Awesome!!! This is the most fabulous block ever! I aspire to make something like that someday....or to have a real-life shelf like it! Parabens pelas mãos que tens. Linda sua criação, ficou fantástica! Parabéns! Really brilliant block ~ you are so talented! I actually love the legs you made for your shelf. They gave it awesome perspective. But it's equally gorgeous without them. I admire the time you took with this, I so would have skipped the bolt ends myself because of that!! This is one of the most amazing blocks I have ever seen. The thought and care that you put into every piece is so evident and the result is stunning. EXACTLY what Megan said… most amazing block ever, and you can see the love and care you but into each seam and piece! You are AMAZING, Ayumi! You are amazing Ayumi!! And so thoughtful about the children in her imagination lol! I don't even want to know how long it took you to piece all of those teeny tiny white tips of the bolts! Hi Ayumi! This is one of most incredible thing I have never seen! Oh, my! You have so many talent! Congrats, sweetie! But I must tell you I loved the legs! I really believe you had done an amazing job with them. Anyway, this project is gorgeous with legs or not. Regards from Brazil! I have to leave a comment, because this block just blew me away! However, I don't have anything fresh to say! The previous comments have said it all! SUPER, AWESOME, MAGNIFICO, UNBELIEVABLE, TOTALLY OUTDONE YOURSELF, SO REALISTIC, ETC, ETC.! Makes me want to shop there. 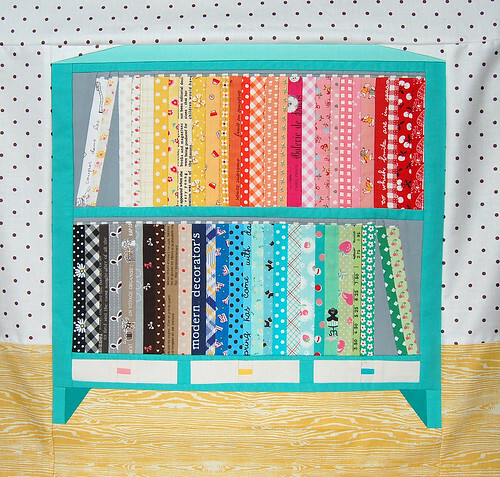 Or paint a bookcase a beautiful teal color with drawers below it with different color pulls and fill it with gorgeous, scrumptious fabric! I love seeing your creations, you inspire me! P.S. I liked the legs, too. P.P.S. What does Joe think? What a fantastic idea! I love all your creations! Yesterday I made three more fabric baskets using your free tutorial, thank you again for sharing it. I posted a photo on Facebook just now and put on a link to your blog so my readers can see your fantastic blog. Thank you so much, Ayumi, for sharing your ideas with us! xo I've been reading your blog for a LONG time and have made several of these little baskets for gifts. I just found your blog and is really really fantastic! I love your work! 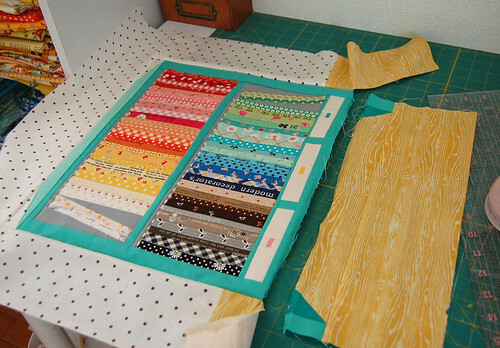 This is probably the coolest paper piecing block I have ever seen! Wow! I wonder how can you have all those patience!!! This is just adorable! You did a fabulous job! Holy smokes. This is AMAZING. I can understand why you were questioning your sanity! This must have taken you a long time to construct. But it's so worth it! I'm sure Amber is over the moon for this block! Auyumi, that is WONDERFUL! You are so talented - talented beyond belief! Every little book is calling my attention. Great fabric choices. :) I do have to say though, I was your biggest fan of the "feet" on the bookcase. I would have left them on. It really added to the dimension. Without them, it is fabulous, but with them, spectacular! Thank you so much for sharing with us. Absolutely fantastic , so clever !! Fantastic rainbow fabric selection! The block is brilliant, and your work is amazing. I absolutely LOVE this! 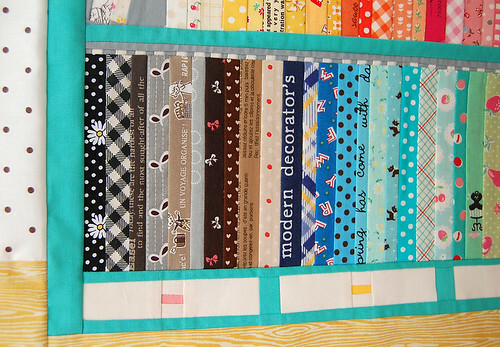 I would sure love to see a quilt or wallhanging planned with this block and other similar ones. 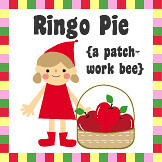 sueanncl@yahoo.com This quilt is adorable. 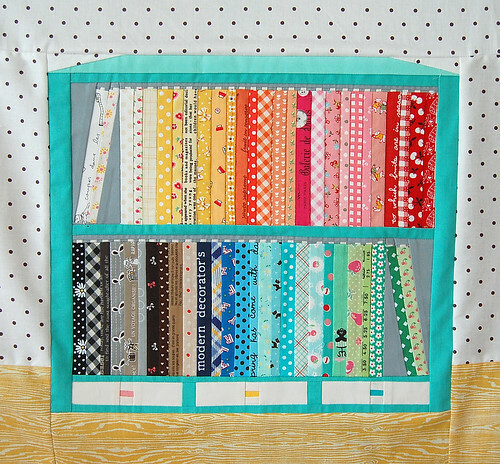 This fabric shelf block is just too cute! Love it. Found your blog via Red Pepper Quilts. I'll be back to read more.